Brace yourself for the most disruptive piece of technology you’ve ever seen: a blockchain fridge. Electronics giant Bosch has teamed up with Austria’s leading energy provider Wien Energie to build a cutting-edge fridge that logs where its energy comes from on the blockchain. Wien Energie says fridge owners will also be able to control the device, view its energy consumption, and choose the energy source that powers the appliance via an app. Putting blockchain aside, this fridge from Bosch and Wien Energie doesn’t really bring anything new to the table as far as features go. Its creators claim its main gambit is to educate owners on their energy usage and let them easily select (and change) suppliers via the blockchain. 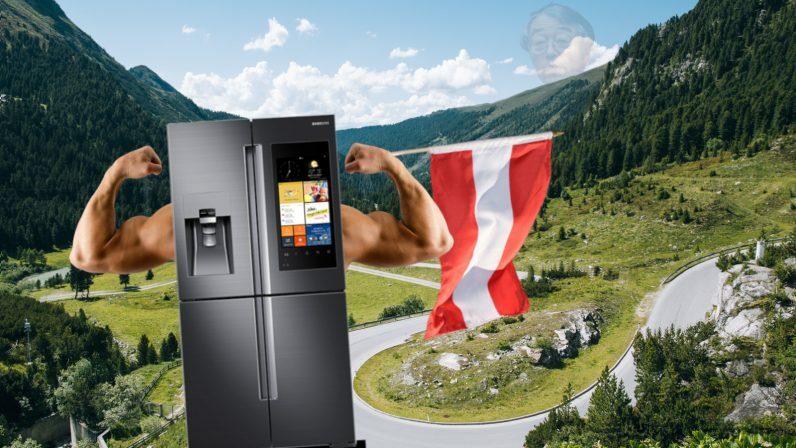 It’s unclear on what blockchain the fridge would run – or what currency it’d use – but we’ve asked Bosch and Wien Energie for a clarification. The fridge will also alert users if the door isn’t closed properly or is open for too long. Personally, I don’t need an app to tell me that, I had too many clips round the ear as a child to find any joy in openly gazing into the cold hazy blue light of the fridge anymore. Also, who needs their fridge opening habits permanently recorded? Thanks to a smart contract, the fridge automatically sends micro-payments for each kilowatt-hour of electricity it consumes, the announcement states. Bosch and Wien Energie claim this creates proof of where that energy came from. In reality though, it’s an over-complicated solution to a non-issue. Fridges need to run round the clock, or what’s inside will go off, obviously. Changing how you power that fridge isn’t going to make that specific fridge more efficient. The only way to make your current fridge more energy efficient is to buy a new one. In some cases, modern refrigerators are up to 60 percent more energy efficient than the models sold before 2000. Changing your energy supplier may reduce the amount of CO2 produced for every kilowatt-hour of energy your devices use. But if that’s what you’re worried about, surely you would want your entire house connected to the most environmentally conscious energy supplier. Speaking of suppliers, it’d be interesting to see the full list of energy suppliers fridge owners can choose among, or if they’d be tied to Wien Energie. What’s more, if you want to educate yourself on how much energy individual devices use, you’d be better served by using a dedicated energy monitor or even a smart plug. You’d gain the same ability to turn devices on and off remotely, and you’d be made aware of which of your devices needlessly hemorrhage energy. Bosch’s blockchain fridge also relies on the assumption that energy grids will be open to supporting the technology. In this case, Wien Energie is seemingly already “on board,” claiming to have built infrastructure to support the fridge, but that doesn’t mean it will be the case all over the world. It might sound cool initially. But, by my reckoning, buying a blockchain-equipped smart fridge is actually a really dumb idea.